Photo District News has announced the winners of its 2015 Photo Annual, including Nancy Borowick, winner of the $15,000 Arnold Newman Prize for New Directions in Photographic Portraiture, and Meeri Koutanimemi, winner of the $5,000 Marty Forscher Fellowship Fund. 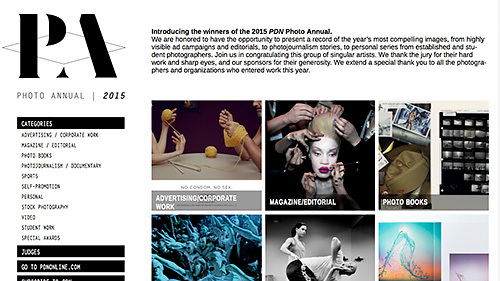 2015 PDN Photo Annual. See the online gallery of winning entries. A gallery of the winning entries can be viewed online. The winners will be honored at a special industry event in New York City on June 10. NEW YORK -- Photo District News has announced the winners of the PDN Photo Annual. They include Nancy Borowick, winner of the $15,000 Arnold Newman Prize for New Directions in Photographic Portraiture and Meeri Koutanimemi, winner of the $5,000 Marty Forscher Fellowship Fund. The PDN Photo Annual, now in its 15th year, is a celebration of innovative work by photographers from all over the world. The competition drew thousands of entries in ten categories, including Advertising/Corporate Work, Magazine/Editorial, Photojournalism/Documentary, Sports, Self-Promotion, Photo Books, Personal Work, Stock Photography, Video and Student Work. The June issue of PDN features a gallery of the 200 winning entries. An extended gallery can also be viewed online at pdnphotoannual.com/gallery/2015. The winners will be recognized during a ceremony on Wednesday, June 10 at the TriBeCa Rooftop. "It seems that each year the quality and creative execution of entries trump those from the year before, which is really quite astounding," says Lauren Wendle, vice president & group publisher at PDN. "After 15 years, the Photo Annual has become an industry-wide celebration of a craft that captures the hearts and minds of people every day in newspapers, magazines, online and on TV and the support by our industry sponsors allows us to honor and celebrate this amazing work." Entries to the PDN Photo Annual competition were judged by a panel of 29 industry professionals. They included James Estrin, co-founder of The New York Times Lens blog; Gregory Heisler, distinguished professor of photography at Syracuse University; Teru Kuwayama, Facebook photo community manager; Michael Norseng, Esquire director of photography; Aidan Sullivan, vice president of photo assignments at Getty Images; Jody Quon, New York magazine photography director; Susan White, Vanity Fair director of photography; Patrick Witty, WIRED director of photography; and other jurors. Nancy Borowick, a New York-based photographer, won the Arnold Newman Prize for her emotional story about her parents as they both faced terminal cancer at the same time. "I am deeply honored to receive this incredible award and to have my name associated with Arnold Newman," Borowick said. "I decided to start photographing my parents because I wanted to have a record or a memory, of this time we shared together. We knew time was limited and I wanted to hold on to everything I could." The Newman Prize is funded by the Arnold and Augusta Newman Foundation with support from Maine Media Workshops, the American Society of Media Photographers and PDN. Meeri Koutanimemi, a 26-year-old photojournalists from Helsinki, Finland, won the Marty Forscher Fellowship Fund professional award for outstanding achievement in humanistic photography. Alexandra Hootnick, a student at Syracuse University, won the $3,000 student award. Both awards are given in memory of a renowned technician who serviced cameras for Diane Arbus, Richard Avedon, Mary Ellen Mark, Joel Meyerowitz and many other photographers. Photographer Jamey Stillings won the $1,500 Epson Creativity Award for "Changing Perspectives: Energy in the American West," an aerial survey of fossil fuel and renewable energy production. Dylan Coulter won the Sony Emerging Photographer Award for his series titled "Anatomy of a Pitch." He used multiple exposures to create composite images for ESPN the Magazine showing how several Major League Baseball pitchers throw curveballs, sinkers and other pitches. Coulter will receive a Sony Alpha a7 camera with a 28-70mm lens. Photographer John Moore was named the winner of the third annual PDN Publisher's Choice Award for his coverage of the West African Ebola epidemic. His work appeared in The New York Times, Los Angeles Times, TIME and The Wall Street Journal. Moore, who is a Getty Images staff photographer, will receive a $1,500 cash prize and a full-page promotional ad in an upcoming issue of PDN. Sponsor for this year's Photo Annual were Epson, Sony, ASMP, Parsons The New School for Design, Arnold & Augusta Newman Foundation, Adorama, Duggal, Hahnemühle and the Maine Media Workshops.